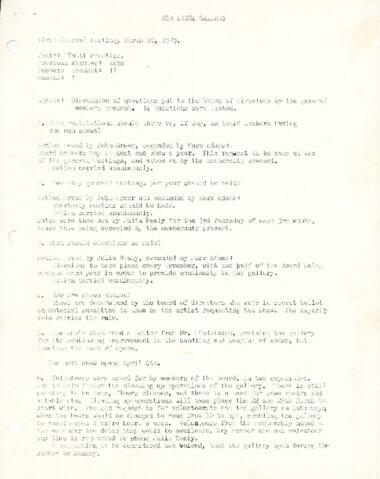 File is a typed document of minutes from a first general meeting at the Eye Level Galley held on March 20, 1975. Present at the meeting at the Chair of the Board, Hatti Prentise, 17 other members and 1 guest. The agenda for the meeting was regarding a discussion of 14 questions asked to the board of directors by the general members present at the meeting. The file minutes also contains a list of memberships of the Eye Level Gallery in 1974-1975.